They are already plenty grown up. It’s their adult critics who are behaving like children. “Grow up.” That seems to be the main sentiment directed at student protesters at the University of Missouri and Yale this week from many quarters. On Facebook, cable news, and op-ed pages, people across the political spectrum have been cherry-picking intemperate student statements at Yale and rushing to denounce the Mizzou media-studies professor who should have known better than to try to exclude a photographer from a public venue. I dissent. The students I know—at Yale, Columbia, and elsewhere—are not asking to be protected from the world. It’s the exact opposite. African-American students come to college already braced for every police encounter to go south. They know that one political party is trying to systematically roll back their generation’s voting rights. Even if their personal prospects seem bright, they see their own communities losing ground, a source of deep personal anguish. These students—my students—have already done plenty of growing up. If anything, they have had to grow up too soon. They are simply asking that university leaders and fellow students do some of that real-world growing up with them. Stirred by the Black Lives Matter movement, this year’s campus protests engage students on some pretty primordial terrain: the day-in-day-out interactions with classmates, teachers, administrators, and police that tell students whether they matter or not, individually and collectively. To off-campus observers, these protests can be confusing. The sparks and targets can seem diffuse, from emotional arguments over offensive Halloween costumes at Yale to allegations of racial slurs at Mizzou. But the stakes are real and have everything to do with some of the most fundamental issues roiling American politics. Can you imagine any American university maintaining a dorm called Himmler Hall? Let’s take Yale, which I know better than Mizzou; I live in New Haven and have taught a journalism seminar in Yale College for over 20 years. The Yale protests have been widely misconstrued as a free-speech fight, putting a professor standing up for Halloween fun against humorless safe-spacers. Here’s the reality. 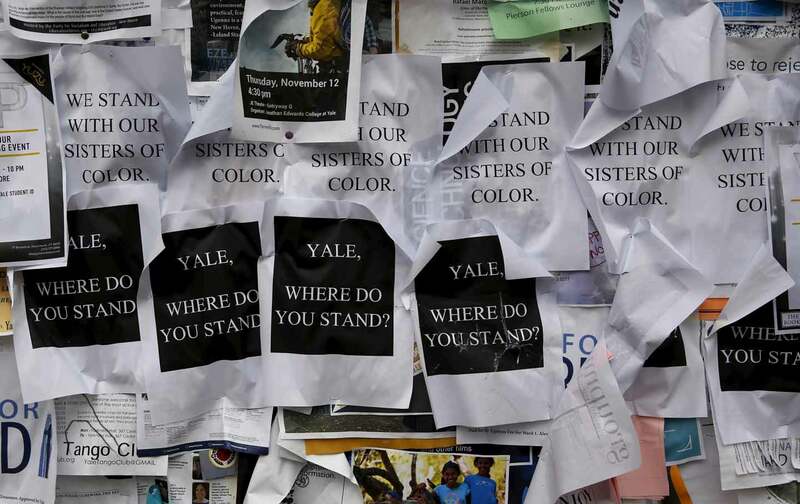 Twenty-fifteen has been a highly charged year for African-American and other minority students at Yale. January began with the gunpoint detention of Tahj Blow, son of New York Times columnist Charles Blow, putting on a global stage the irrefutable fact that matriculation at an elite university is no protection against potentially lethal encounters between police and African-Americans. Throughout this same year, Yale students, faculty, and alumni have been locked in painstaking consideration of whether to rebrand the residential college, named since 1933 for the preeminent champion of slavery John C. Calhoun. (Test: Can you imagine any American university maintaining a dorm called Himmler Hall?) The professors who lead all of Yale’s residential colleges—its dorm system—have been publicly debating whether to abandon the provocative title of “master,” with its unhappy echoes. And perhaps most significantly, students have looked on powerlessly as Yale has lost one preeminent minority faculty member after another to other schools—most recently poet and literature scholar Elizabeth Alexander to Columbia and acclaimed anthropologist and LGBT researcher Karen Nakamura to Berkeley. This is what has really been going on at Yale for the last year. And this is why so many students were shocked and angered when Erika Christakis, the associate head of one of those residential colleges—responsible, in university terms, for the social ecology of hundreds of undergraduates—chose to pick an e-mail fight ahead of Halloween with campus minority-affairs counselors who had written a mild note asking students to be mindful of racist costumes. This wasn’t a grown-up civil libertarian making the free-speech case to hopelessly coddled students. It was the other way around: a residential-college administrator who broadcast a childish, poorly thought-out message to a student body sobered by months of soul-searching about their institution, their society and the price of black lives. Once the history of violence is on the table, you can’t expect anything but a challenging conversation. People, we live in a post-traumatic culture. You can’t ask the world to embrace the psychological injuries of combat veterans and 9/11 survivors and at the same time expect students of color to shut up about the emotional legacies of racism. You can’t expect female students to shut up about the stresses and complexities of living on campuses that until very recently were as complicit in covering up sexual assaults as the archdiocese of Boston. And once the history of violence is on the table, you can’t expect anything but a contentious and challenging conversation. At bottom, this is a matter of whose stories get told—not just in history books but bolted into the structure and expectations of educational institutions, and ratified in action by its leaders. College is supposed to be the great leveler. But at a time of unprecedented economic inequality, students of color, immigrants, and students from low-income background—at rich, elite universities, and state schools alike—are painfully aware that the experiences they bring to campus are ill-appreciated by many classmates, teachers, and administrators, who come overwhelmingly from a culture of middle-class safety nets and an economy that rewards those who already have. That’s the issue. There is also the matter of leadership—and this is the thread running from a lowly residential-college associate master at Yale to the president and chancellor of Mizzou. If there is one lesson from the history of civil rights in the United States. it is that leadership matters—not just on the substance of legislation, hiring or executive orders, but leadership in the face of emotionally evocative symbolic and narrative disputes. Think back only a few months to the Mother Emanuel church shootings (part of the psychic backdrop to this month’s protests) and the crucial way that not only Barack Obama but Republican Governor Nikki Haley rose to the occasion—in her case by acting, swiftly and decisively, to remove the Confederate flag from the state capitol. Leadership matters. The students at Mizzou—protesters and athletes alike—understand that. Their president didn’t. Are there important arguments to be had? Of course. There are important arguments to be had about satire and art, about faculty hiring and retention, about the responsibilities of universities. I wish so many demonstrators, and for that matter so many professors, wouldn’t treat “the media” as an undifferentiated enemy—just as I wish more of my journalist colleagues would treat students with the same deference afforded politicians and executives. (My reporter’s heart stirred at the calm and dignity that Mizzou student photojournalist Tim Tai showed in a difficult showdown with protesters, a confrontation initiated, it should be noted, not by his classmates but by yet another adult-in-the-sandbox who has since apologized). I also wish today’s campus activists would more deeply interrogate the relationship between real violence and its lingering echoes in daily life, to think through the differences between trauma and distress, two very different things, and set aside the easily-parodied cant of trigger warnings and safe spaces. Now as ever, it is easy to wish for always-wise protesters. But eye rolling doesn’t advance the discussion; these students and their protests deserve respect and support.